On Monday, I had the wonderful opportunity to walk through my third graduation ceremony for what is effectively the same degree! So a bit on how that happened, maybe? Well, I completed my Bachelor of Science with Honours degree in June, from which I graduated with First Class Honours in August. 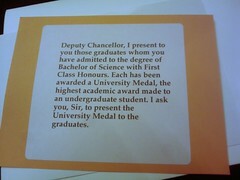 Just on two weeks ago, I received a further letter, suggesting that I attend another graduation to collect a University Medal. 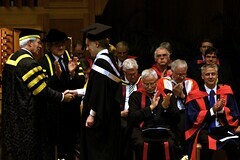 The University Medal is the highest award that can be awarded to an Undergraduate Student at the University of Tasmania, and my friend Josh Deprez did an exceedingly thorough writeup of the dimensions etc of the Medal itself when he won his last year. Hmmm. Not so convinced I want to aim for a uni medal now. 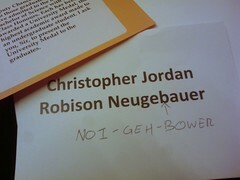 Really really worrying about the number of opportunities the dean would get to mispronounce my name. The result wasn’t that bad (Something along the lines of ‘Neu-bauer’, which I’ll accept as a pass :D).